*This is not the recommended way to remove a hornet nest from your property. My wife and I recently told her brother about the situation, and he has a little experience with insect removal on his own property. *Warning there is a bit of profanity in his videos, and you may see grown men screaming like little girls. As you saw, he does have some related experience, so I gave him a chance today to remove a hornet’s nest for me. This is my footage of the way we decided to remove a hornet’s nest from about 15′ up in a tree. 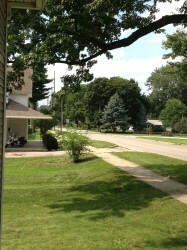 Since the hornet nest was about 15′ in the air, I got out my telescopic pruning saw. We used masking tape to attach a candle to the end. You see, my brother-in-law decided that using a squirt gun that he would douse the nest in gasoline, and then we would light the nest on fire with the candle on a pole. This idea may have worked well, except for the fact that he had bought a $5.00 squirt gun, and not a nice super soaker. It wouldn’t shoot the required 15′ to the nest. Next we improvised. 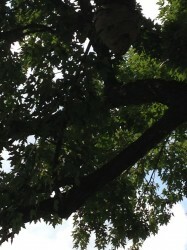 We were to remove a hornet’s nest today! We removed the candle from the saw, and then taped a Manwich can to the end of it. We poured some gasoline into the can and poured it directly onto the hornet’s nest. Then we put some paper towel into the can with a bit more gasoline, and lit that on fire. This acted as a torch to effectively burn the nest above. We had to repeat the process once to get the entire nest burnt. 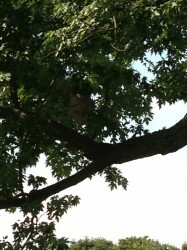 At long last, we did remove a hornet’s nest from the tree. We cut the remnants down for good measure. I think tomorrow I may have to go ahead and spray some Raid up on the branch where the hornet’s nest once was because there are about 50 of them that look to build again. Again, I don’t really recommend this method for how to remove a hornet’s nest, even though it did work. I think next time I’ll wait for winter and cut it down when the hornets are dormant.